What makes the Lexus RC unique? In a sea of platform sharing, the RC is a refreshing departure – it was developed from the ground up as a dynamic coupe, not a two-door derivative of a sedan. The result is a purpose-built, bespoke chassis with the stiffness and strength to accommodate a sporting yet supple suspension. This translates into a car that literally gives you the best of all worlds from a ride and handling point of view. The RC chassis architecture takes inspiration from other recent Lexus vehicles: the stiff and responsive front end from the GS, the centre from the IS C for underbody strength, and the traction-aiding rear end from the IS sports sedan. Despite being a niche, somewhat self-indulgent piece of vehicular kit, the RC nevertheless has an important role to play in the Lexus line-up as Glenn Crompton, Vice President of Marketing for Lexus points out: “As with other recent offerings from the marque, the RC takes Lexus in a new direction with its show-stopping styling and drive experience, and is designed to engage with a younger audience.“It also provides a clear aspirational target and injects a stronger connection to the brand, while staying true to the Lexus ethos of impeccable quality and innovation. “Our iconic LFA supercar embodied Lexus’ passion and acted as an emotional drawcard, and as such, it was one of the most important models we’ve ever produced. However, it was off limits to most buyers. This new model brings a portion of LFA’s excitement to a more attainable market segment, and it will boost the brand’s appeal even further. I’m confident it will resonate with a select set of discerning South African customers,” Glenn said. Internationally the Lexus RC line-up comprises a trinity of models including the RC 200t and the fire-breathing RC F 5.0-litre V8. The local range kicks off with the RC 350 F-Sport and will be supplemented by the RC 200t in EX trim in a few months. For now, the hallowed RC F is not on the cards for South Africa. A purpose-designed coupe, the Lexus RC successfully marries L’Finesse design language and the now de rigueur spindle grille to create a look that symbolises Lexus’ forward thinking design strategy in a unique two-door body shape. 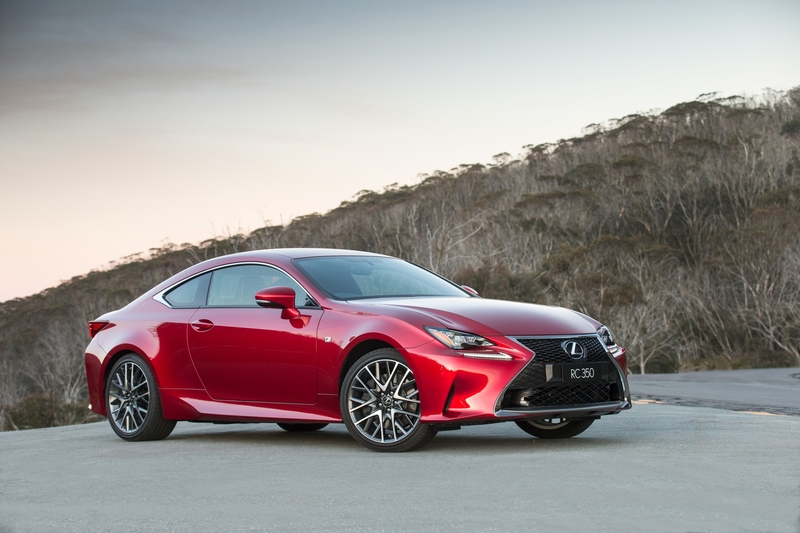 RC 350’s wheelbase is just 2730mm in an overall length of 4695mm with a roof height of just 1395mm, which highlights the coupe’s purposeful and squat stance. Its spindle grille is the widest and lowest of all Lexus models and is flanked by wide bumper corners and front flares, as well as a low-set bumper peak to emphasise its low centre of gravity. Being an F-Sport, this RC features an L-mesh grille design. Bold lines flow from the spindle grille across the entire body to create an aggressive appearance. The side design emphasises the car’s low centre of gravity, while the subtly pleated side sills and beltline lend a sophisticated air. The rear styling echoes the shape of the spindle grille while displaying RC 350’s wide track. While on the subject of showing up the coupe’s sensuous lines, Lexus has introduced a unique five-layer paint process, which marks the first time such a system has been used in mass production, to give RC the deepest, most brilliant finish imaginable – when specified in signature Solar Storm Red of course. On the light front, the Lexus RC 350 has state-of-the-art multi-LED headlamps, tail lamps and fog lamps, as well as LED daytime running lamps (DRLs) for optimal vision and minimal power usage. LED technology is also applied to the high-mount stop lamp, rear licence lamp, turn-signal lamps in the exterior mirrors and puddle lamps on the underside of the door handles. The RC 350 has dual LED headlamps (high and low beam) with three LED lamps arranged in a triangular layout and separate L-shaped DRLs. With reference to the latter, these were kept as thin as possible so as not to jar with the fluid coupe lines. The low-beam lamp also adopts an L-shaped design to immediately express the Lexus identity. The RC 350 F Sport has the added convenience of the Lexus Automatic High Beam (AHB) system – automatically dips for you when an oncoming car is sensed. 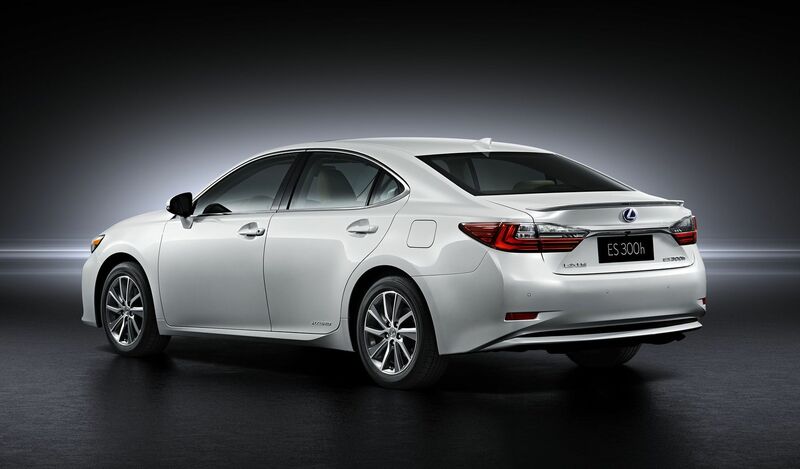 The combination rear lamps also adopt the Lexus L-shape motif, which is highlighted when the lamp is illuminated. What’s more, the surface of the tail and stop lamps is raised to create a three-dimensional presentation of the L-shaped motif. Much more than just a pretty face, aerodynamic tweaks above and beneath the skin of RC 350 assist handling and complement other systems, including engine cooling. Air ducts, for example, integrated into the corners of the front bumper control airflow to the sides of the body. An aero stabilising guide mounted immediately behind the front bumper diverts airflow entering through the front grille and stabilises it before it enters the radiator to enhance engine cooling efficiency. A front air deflector and groove-shaped front fender liner minimise airflow reaching the front wheels, contributing to aerodynamic efficiency on the side of the vehicle. The rear air deflector performs the same task for the rear wheels, while a bead has been adopted for the rear fender liner to effectively divert airflow generated by the rotating wheel to the outside, which helps optimise airflow through to the rear. The rear bumper corners include vertical fins, which smooth airflow. Similarly, the rear bumper’s lower garnish is sculpted to direct airflow to the rear of the vehicle. The RC’s rear combination lamps also feature vertical fins as does the tip of the door frame moulding to provide optimal straight-line stability and to suppress steering wobble. The boot lid has a sculpted shape to stabilise airflow from the roof of the vehicle. Attention was also paid to the underbody aerodynamic design to enhance efficiency. There are engine, floor and rear floor undercovers to smooth airflow and stabilising fins help to reduce turbulence. Rounding off the RC’s dynamic profile are F-Sport exclusive multi-spoke 19-inch alloys with overlaid pairs of 10-spoke sets. The outer set of spokes is machine-finished, while the inner set has dark grey metallic paint to create an off-set pattern and add three-dimensional depth. As mentioned at the outset, the Lexus RC 350 has been designed from the ground up as a coupe, but it takes engineering cues from other Lexus models. 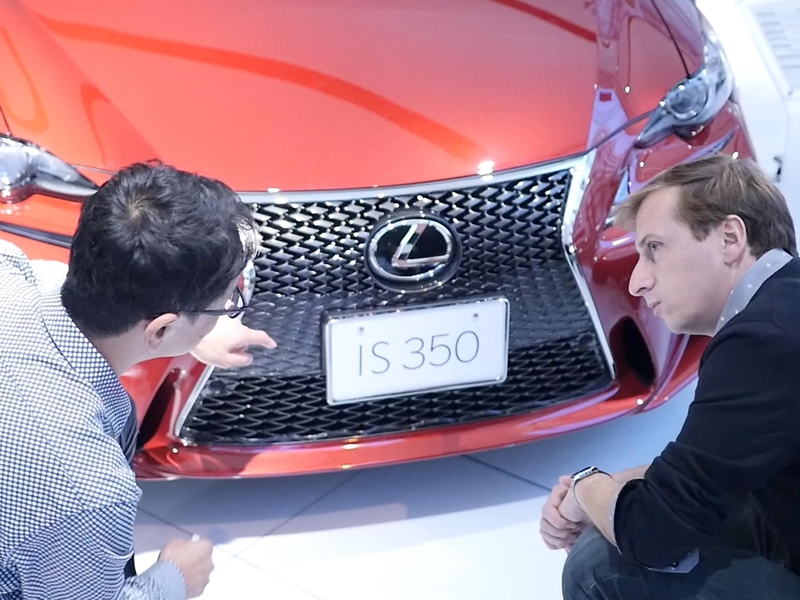 The front end of RC 350 is based on the highly acclaimed Lexus GS, which set new standards for stiffness and chassis response in a mid-sized sedan and is capable of containing both a 3.5-litre V6 engine and a world-class hybrid package. The centre of the RC is inspired by the Lexus IS C convertible with larger rocker panels that contribute to high body rigidity. The rear is based on the recently released IS Line and is designed specifically to accommodate a rear wheel drive package in which traction and power delivery is a priority. This ‘dream team’ combination provided engineers with a rigid platform featuring a wide stance and optimum length to deliver the dynamic and handling traits ideally suited to a grand touring coupe. Note however that none of the three designs are directly taken from these vehicles, though all are regarded as contributing more than the sum of their parts to the RC 350’s overall chassis package. The new chassis also benefits from six strategically placed braces, each of which reinforce and stiffen the entire platform in critical areas, including: radiator support, sub frame brace, underfloor A-brace (from firewall to engine sub assembly), transmission tunnel brace, trapezoidal brace (under rear floor), and fuel tank brace (running front to rear). Other measures to increase stiffness include body bonding, laser screw welding and, for the first time in a Lexus, high rigidity glass adhesive that allows window glass to be treated as a structural member of the chassis. RC 350’s suspension delivers a focused driving experience while enhancing ride quality. It has front and rear coil-spring independent suspension with monotube dampers and ball-joined stabiliser bars to enhance cornering potential. The rear suspension has a double wishbone assembly and a multi-link system with a castor-locating rod for maximum rear grip and balance. The front suspension has a 15 per cent stiffer spring rate than the GS chassis on which it is based and there is a new calibration for the bushings, springs and dampers, which is aimed at achieving less roll angle while maintaining ride comfort. Numerous suspension components are new, including front upper support, coil spring, damper, stabiliser bar and bushing, and lower number two bushing. The rear coil springs, dampers, upper number one arm, lower number two arm, stabiliser bar and stabiliser bushings are also new. The toe control arm from the GS Line has been adapted to optimise rear grip. Additional body strength was the decisive factor in achieving the high performance suspension upgrades. RC 350 is considerably stiffer than the chassis that contributed platform technology, enabling higher damping forces and larger diameter front and rear stabiliser bars. These enhancements improve handling without affecting ride quality. The RC 350 F Sport is fitted with Adaptive Variable Suspension (AVS), which electronically controls and monitors all four dampers simultaneously to suit certain conditions and driving preferences. It aids ride comfort when driving on rough roads by lowering the damping force but can also deliver a sporting drive with greater response and handling stability by increasing the damping force when SPORT S+ mode is engaged via Drive Mode Select. AVS also interacts with RC 350’s Vehicle Dynamic Integrated Management (VDIM) to optimise damper rates to prepare the vehicle during potentially hazardous driving situations. For example, AVS will increase front damper force to prevent dive during emergency braking. It also monitors steering operations and road conditions and adjusts the dampers to suit, monitoring inputs on vehicle posture including roll, dive and squat. Lexus RC 350 has electric power-assisted rack and pinion steering (EPS) for agile driving, responsive steering feel and confidence-building straight-line stability. The F Sport model has the additional feature of Variable Gear Ratio Steering (VGRS) on the front wheels and Dynamic Rear Steering (DRS) on the rear as part of a three-fold Lexus Dynamic Handling (LDH) strategy. RC chassis engineers set three goals for the new coupe: excellent steering response and smooth roll transfer during initial turn-in, minimal roll and rapid yaw-rate gain for agile turning mid-corner, and smooth steering feel with smooth sprung mass (body) movement from corner to corner. RC 350’s excellent steering response makes it easy for the driver to aim for the corner exit. Steering feel and response have been further optimised by adopting a new, high-rigidity gear-mounting bushing for the steering rack. Development also focused on obtaining smooth and accurate vehicle response to small steering inputs to correct changes in the road surface, cross winds and other conditions, to ensure straight-line stability and help achieve a high-quality ride. The EPS integrates with the Drive Mode Select to adjust steering response for the different drive modes. The steering power-assistance curve can be varied to increase steering feedback, for a more direct steering feel – this occurs in SPORTS S+ setting. The F Sport model has the added feature of Variable Gear Ratio Steering (VGRS), which controls steering ratio according to vehicle speed and steering operation. The latest-generation Lexus VGRS has the actuator unit on the steering column with an integrated rubber damper to reduce noise and vibration. VGRS has three benefits: fewer turns of the steering wheel are needed to achieve maximum wheel turning angle at very low speeds (parking or making a U-turn), reducing driver effort; light, easy-to-handle steering at moderate speeds – for urban driving or winding roads; and a firm steering feel and reduced turns lock-to-lock for optimum control at higher speeds. It improves driving feel during lane changing and on winding roads by correcting the vehicle’s response lag in accordance with steering-angle velocity. RC 350 F Sport also has Dynamic Rear Steering (DRS) which provides the benefits of four-wheel steering while maintaining the feeling of a conventional two-wheel steer vehicle. Depending on speed, this feature turns the front and rear wheels in the same or opposing directions to help provide optimal agility. These three features – EPS, VGRS and DRS – have been collectively dubbed the Lexus Dynamic Handling (LDH) system. Working in unison this system enhances manoeuvrability, reduces steering effort at low speed, increases steering responsiveness and intuitive steering feel at medium speeds, and improves overall stability and vehicle posture for increased safety and comfort at high speeds. The 3.5-litre Lexus dual-injection 2GR-FSE V6 in Lexus RC 350 delivers a rare, charismatic concoction of power, torque and responsiveness for a thoroughly engaging driving experience. This engine has been proven in Lexus models around the world and meets driver expectations for responsive acceleration. The 2GR-FSE engine has intelligent dual variable valve timing (VVT-i) for inlet and exhaust camshafts, an intelligent electronic throttle, and the Lexus D-4S system of direct and port fuel injection. The quad cam V6 engine has two petrol injection systems, including high-pressure direct injection. Lexus designed the all-alloy 60-degree V6 for a combination of high performance, fuel efficiency, package efficiency, reliability and serviceability, coupled with light weight, low noise, vibration and harshness (NVH), and low emissions. It delivers 233kW of power at 6400rpm and 378Nm of torque at 4800rpm, equating to a 0-100km/h sprint time of 6,3 seconds, topped off by a maximum speed of 230km/h. It produces fuel economy figures of 9.4-litres/100km combined, CO2 emissions of 217g/km and is Euro-5 compliant. The 2GR-FSE engine is matched to an eight-speed transmission with M Mode, allowing full torque-converter lock-up from second to eighth gears. The eight internal ratios have been chosen to balance the needs of sports driving and fuel economy – with a low first gear ratio for initial acceleration, closely spaced ratios in the intermediate gears for performance and urban-driving economy, and a tall eighth-gear ratio for motorway economy. The torque converter has a long-travel damper to boost fuel economy and reduce NVH during lock-up. The transmission can be used in D (automatic) or M mode, which has full torque-converter lock-up from second to eighth gears for ‘clutchless’ manual shifting, utilising steering paddle shifts* if preferred. Down changes in M mode are made in just 0.2 of a second, with the transmission’s throttle blipping control matching the engine speed to the gear. In addition, the RC 350 transmission is linked to the Lexus Drive Mode Select function, with its ECO, NORMAL, SPORT and SPORT S+ settings. NORMAL mode provides the fuel economy and seamless acceleration traditionally associated with a Lexus electronically-controlled transmission. It uses the eight ratios for optimum fuel economy, while coordinating control with the throttle to provide smooth acceleration with minimum feeling of gear changes. SPORT and SPORT S+ modes include newly adopted G-sensor AI-Shift Control, which uses information from the G-sensor on driving status to provide the optimal gear ratio for performance driving. The system selects the suitable gear for sporting driving by monitoring the status of the vehicle’s G-sensor, with shifting selection biased towards the lower gears to draw out the full potential of the 3.5-litre engine. The transmission uses G-sensor information to automatically downshift during hard braking to set up for a corner, hold a lower gear through the corner for greater control, and then give the driver a greater power response on corner exit by selecting a suitably low gear. While on the subject of Drive Mode Select, modes can be adjusted via the circular knob beside the gear selector and instrumentation changes colour or theme to reflect the selected mode. In addition to controlling throttle opening and engine output control, SPORT S+ optimises chassis elements including Variable Gear Ratio Steering, Lexus Dynamic Handling (on F Sport variants only) and Adaptive Variable Suspension output to provide RC 350’s most dynamic and focused driving experience. The Lexus transmission software also monitors throttle opening to provide the acceleration the driver requires. It can initiate a quick downshift depending on throttle position to ensure responsive re-acceleration out of a corner or a quick upshift to maintain momentum. * The steering mounted paddle shifters provide fast up-shifts and throttle blipping on downshifts. The paddle shifters can also be used in D (automatic) mode to initiate downshifts. This feature, known as ‘temporary sequential mode’, helps the driver set up for a corner or simply slow the vehicle in a low-speed zone. The current gear can be seen in the Multi Information Display (MID). The transmission returns to normal operation from temporary sequential mode when the vehicle stops, is driven at a constant speed for more than one minute (in fourth gear or above) or the driver holds the up-shift paddle. In ‘Sport M’ transmission mode – which the driver selects by moving the shift lever to M while in the SPORT drive modes – the vehicle can be driven with the feeling of a manual transmission. This setting provides gear holding and solid gear shifting using Lexus SPDS technology. The Lexus RC has all-new, purpose-designed seats and a low hip point to provide an optimum driving position and cosseting atmosphere befitting a modern sports coupe. In keeping with its premium status it’s swathed in deluxe, soft-touch textures punctuated with tasteful metallic accents adorning the doors and dashboard. The silky smooth leather seats incorporate a number of measures to minimise body movement during spirited driving. They have a long cushion length to support the thighs, extensive lumbar support to encourage correct posture and grooves where the hips contact the cushion to prevent sliding. And, rear seat occupants have not been forgotten either. A walk-in function, for example enhances rear seat accessibility – the seat automatically slides forward when the front seat-back is folded via the lever on the shoulder recess, aiding passenger entry and exit. The interior trim around the door opening has also been specially designed to provide a wider access space for rear passengers. A further ‘trick’ is the memory function that returns the driver’s seat to the original position. As far as rear seat comfort goes, grooves have been integrated into the rear seat where the passenger’s hip makes contact with the cushion, which enhances support and by preventing their hips from sliding fore and aft. 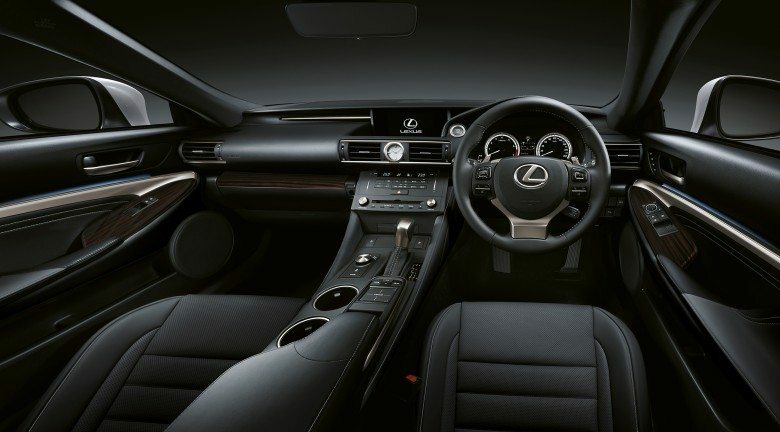 The RC 350 F Sport upholstery can be specified in Dark Rose and Black leather. RC 350 has a 60:40 split rear seat, allowing items measuring up to 1500mm to be loaded in the vehicle. The split rear seat can also be folded via a lever in the boot area, aiding convenience especially during inclement weather conditions. The boot has generous proportions, offering 1061mm in depth, 1544mm in maximum width, 472mm in height and 1055mm in lower width opening. It can accommodate two full size (24.1cm x 119.3cm) golf bags with the 60:40 split seat still in its upright position. The boot lid U-arms are covered in trim to provide a premium, uncluttered appearance in the cargo area. From a driver’s perspective, the RC comes fitted with an array of high technology interior appointments designed to work intuitively for comfort, control and enjoyment. In true F Sport cockpit style, traditional instruments are replaced with a display inspired by the instruments of the LFA supercar. An eight-inch TFT LCD displays the tachometer and other vehicle systems in detail, and the dial and indicator can be viewed in blue, white or red depending on personal preference. The meter ring also slides across to reveal a menu just like that of the LFA when the multimedia system is activated via the steering wheel switch. The seven-inch electro multi-vision navigation (EMVN) display screen is centrally mounted in the dash, reducing the need for eye movement away from the road. It provides navigation and audio information and works in conjunction with the new Lexus Remote Touch (LRT) Interface with touch pad. The LRT functions in a similar way to a smartphone touchscreen for intuitive operation. The steering wheel also places a range of controls at the fingertips of drivers: audio, telephone, voice recognition (for SatNav and phone and iPod functions), Multi Information Display (MID), cruise control, Lane Departure Alert (LDA) and gear shift paddles. The RC F Sport features a 256-watt Pioneer 10-speaker system as standard, for unparalleled clarity and tone. The audio system incorporates technology that compensates for compressed sound sources such as MP3, enabling premium audio playback quality. Additionally the system features advanced Bluetooth capabilities, including Bluetooth audio streaming and automatic phonebook transfer, as well as iPod and USB connectivity with voice control for iPod to provide ease of use while driving. Interior temperatures are set with electrostatic air conditioning controls for either side of the vehicle, which allow adjustments in 0.5 degree increments. These are operated by sliding a finger on the bar-shaped switch or pressing the top or bottom half of the switch, or touching the arrow markings. Worthy of special mention, the Lexus RC 350 has turned conventional interior lighting ideas on their head to produce a high-quality, luxurious ambience. The RC has Lexus-first upward-facing indirect door illumination, creating a welcoming atmosphere similar to that of lighting found along the pathways of homes. RC interior designers believe the technique is particularly suited to a coupe, directing occupants’ eyes to key cockpit features. The door indirect lighting system illuminates when the engine is turned on and then dims to an appropriate level during driving. RC adopts warm white LED interior lighting to express brand unity and a luxury feel while minimising heat and energy use. This includes the door ambient illumination, door courtesy lamps, overhead console, vanity lamp, rear reading lamp and luggage compartment lamps. The dome lamp on the overhead console and the rear reading lamp illuminate as a welcome feature when the owner approaches the vehicle with the wireless key. The RC also features touch-sensitive switches in the head lining, to operate the front and map lamps. 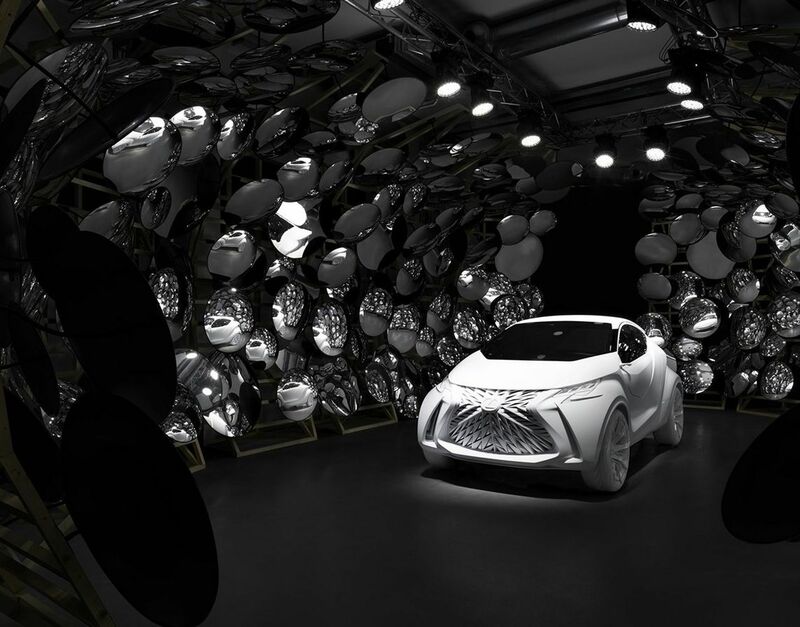 This technology, a Lexus first when recently launched in the NX SUV, uses a microprocessor to detect the proximity of the user’s finger and turns the lamps on or off. The new Lexus RC 350 has a comprehensive passive safety package. It has a high-strength safety cell body structure, head and hip/abdomen-impact protection interior cabin features, ISOFix child restraint anchorage points and the added pedestrian-safety measure of a pop-up bonnet. The RC is equipped with eight SRS airbags – a dual-stage driver’s airbag, dual-stage and dual-chamber front passenger airbag, driver and front passenger’s knee airbags, large-sized front-seat side airbags to better protect the occupant’s hip and abdomen, and full-length side curtain-shield airbags. The front passenger’s seat has an occupant detection system that determines if the seat is occupied for the seatbelt warning system and to match airbag deployment to sensed conditions. The cabin has a raft of additional passive safety features, including head-impact absorbing structures in each pillar and the roof head lining. An abdomen-absorbing impact structure has been added to the door armrest, while the lower door trim and the lower rear-quarter panel trim have impact-absorbing material designed to protect the occupant’s hip and lower back in a side collision. 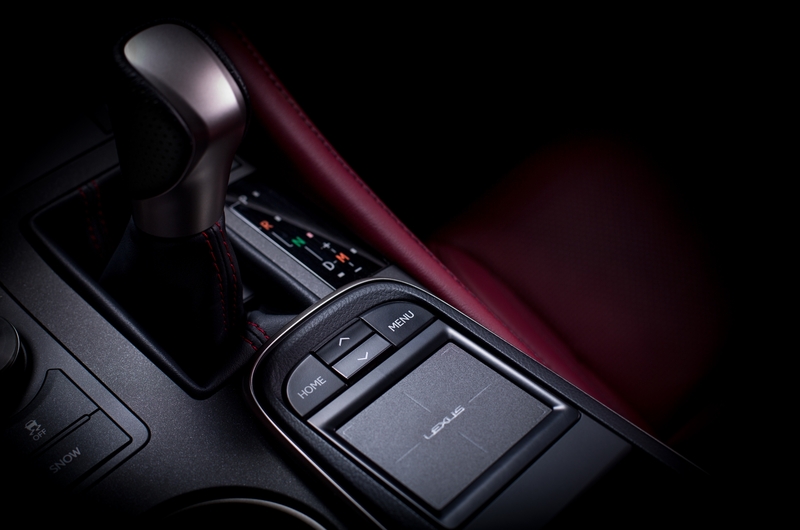 The RC 350 F Sport also boasts an impressive suite of active safety features, all coordinated by the Lexus Vehicle Dynamic Integrated Management (VDIM) system. These electronic safety measures include vehicle stability control, traction control, and ABS brakes with electronic brake-force distribution and Brake Assist with the additional support of the Adaptive Variable Suspension system (AVS), Variable Gear Ratio steering (VGRS) and Dynamic Rear Steering (DRS). In F Sport guise, the RC features larger, two-piece front brake rotors, high-friction brake pads and a unique multistage booster for optimised control, response and feel. VDIM anticipates any loss of traction and ensures the traditionally separate active safety systems of vehicle stability control (VSC), traction control and ABS anti-lock brake system as well as the aforementioned support systems work in concert to correct any potential emergency. The Lexus VDIM functions also include Hill-Start Assist. 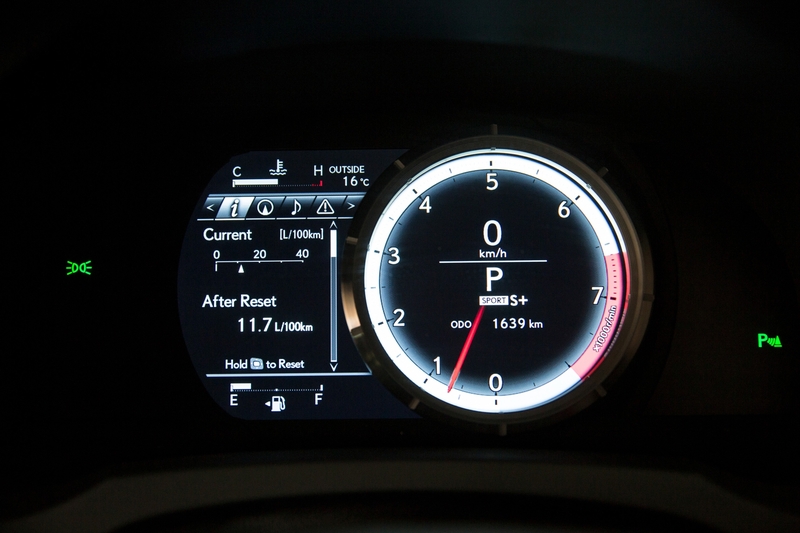 The RC 350 F Sport also comes standard with Lane Departure Alert (LDA) and Auto High Beam. Lexus Lane Departure Alert (LDA) works by warning the driver if the vehicle is about to cross lane markings without using the turn signals. It warns the driver via a buzzer and the Multi-Information Display if the vehicle is veering unintentionally outside the traffic lane, and helps avoid a collision. LDA uses a lane recognition camera mounted on the windscreen, near the interior mirror, to monitor the vehicle’s position on the road. LDA can operate during rain and when only one side of the road has a line marker. A switch on the steering wheel allows the system to be turned on and off. The Auto High Beam system uses the same windscreen-mounted camera (and microprocessor) as the LDA, continuously monitoring tail lamps of preceding vehicles as well as the headlamps of oncoming vehicles. This driver assist device helps avoid the burden of manually switching between high and low beam. The system will automatically dip the headlamps if the distance to an oncoming vehicle is less than 800 metres. It will resume high beam when the oncoming vehicle passes at approximately a 50-degree angle. 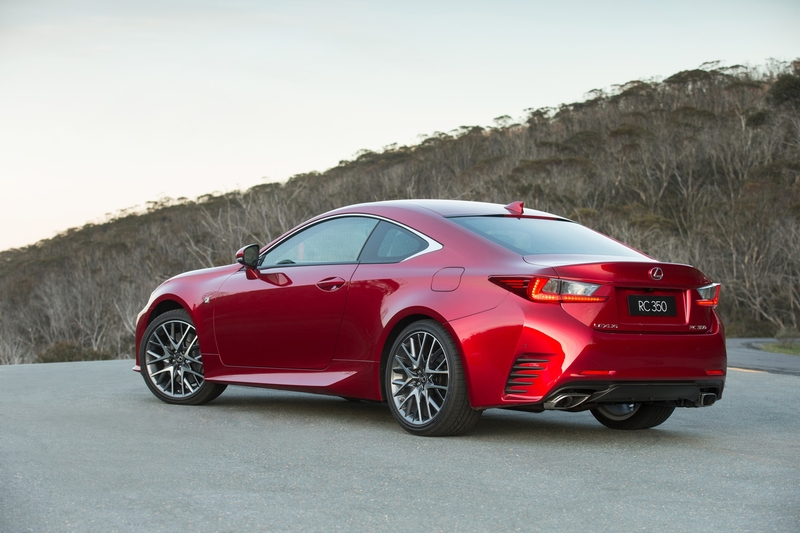 The sharply styled RC F Sport offers equally sharp pricing. It carries a price tag of R730 900 – no options required or offered as everything is standard. The RC 350 F Sport comes standard with a four-year / 100 000km Lexus Distance Plan Complete full maintenance plan and features a four-year / 100 000km warranty. Type Front Double wishbones with high-mount upper arms, coil springs, gas-filled shock absorbers, stabiliser bar. Adjustable Variable Suspension. Rear Multilink, coil springs, gas-filled shock absorbers, stabiliser bar. Additional features Four-wheel power-assisted disc brakes with Anti-lock Braking System (ABS) and Electronic Brake Force Distribution (EBD), Brake Assist (BA), Vehicle Stability Control (VSC) and Traction Control (TRAC) – all systems integrated with Vehicle Dynamic Integrated Management system (VDIM). Land Departure Alert (LDA) is standard.